Full election results from the Missouri Secretary of State's office, are here. Discussion of the results for ballot issues and St Louis's changes to the Board of Aldermen here. Summary of results for the Missouri legislature here. Streetsblog's summary of the affect of elections on the upcoming federal transportation bill here. Missouri's general elections are being held across the state on Tuesday, November 6th, 2012. 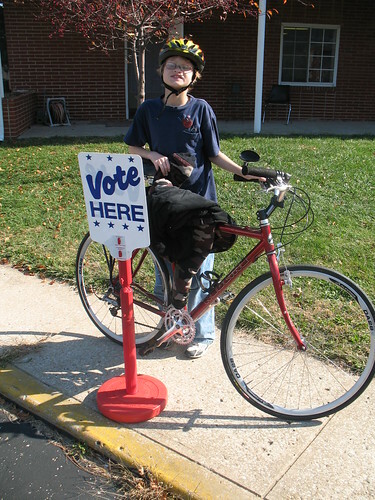 "I bicycle/I walk/I run and I vote" is one of the most powerful statement we can make to any elected leader, in our work to make Missouri a better, safer place to walk and bicycle. Polling places are open 6am to 7pm on Election Day. You will need some form of ID. More info and FAQ about voting here. Voter Bill of Rights here. Find your sample ballot here - lists your polling place with address, all offices and all candidates, and all ballot issues that will appear on your own ballot. This also verifies that you are registered to vote. Put your address/zip code OR any state/federal candidate's name into the Project VoteSmart search box to find background, biographical information, and links to the candidate's web site. Project VoteSmart now has updated district/zip code directories for the November 2012 elections and this is the easiest way to find your districts and candidates. Proposition A Law enforcement Requires that all municipal police forces or departments be controlled by the local governing body. Proposition B Tobacco Imposes an additional $1 tax on each package of twenty cigarettes. Proposition E Health care Prohibits creation of a health insurance exchange unless created by legislature or initiative. The officially approved ballot language for all four November ballot issues is here. In Missouri, 63 local ballot issues in 25 counties will be up for a vote November 7th. Issues affect areas ranging from neighborhoods to cities to multiple counties. Common issues include bonding, judge retirement age, creation or continuation of various taxes, and creation of local use taxes (like sales tax but applied to internet and other out-of-area purchases). See the full list of local ballot issues, including area affected and ballot language, here. (I) = indicates current incumbent in that office. Project VoteSmart's zip code lookup tool will tell you your new districts--and link to candidates as well. Find your sample ballot on the Missouri Secretary of State web site. The sample ballot will list your districts and all candidates. Find the updated 2012 Election district maps at the Missouri Secretary of State's web site. » Next story: News roundup: Kirksville's secret sidewalks, I-64 bridge bike/ped path, why use bike lights?